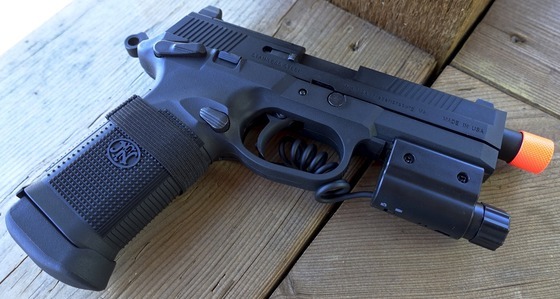 Type: Airsoft Gas Blowback Pistol. Weight: 2.09 pounds (950 grams). Propulsion: GBB - Green Gas or Propane. Action: Semi auto, single & double action with full blowback. Ammunition Capacity: 25 round full size drop out metal magazine. FPS: 366+ with extended barrel. 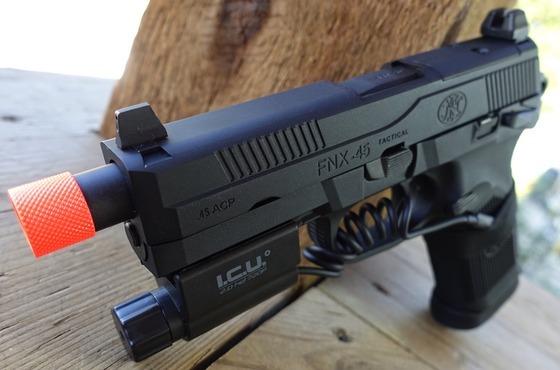 Trigger Pull: The trigger pull on the VFC FN Herstal FNX45 Tactical GBB Airsoft Pistol is surprisingly light in single action mode, there is also minimal takeup. 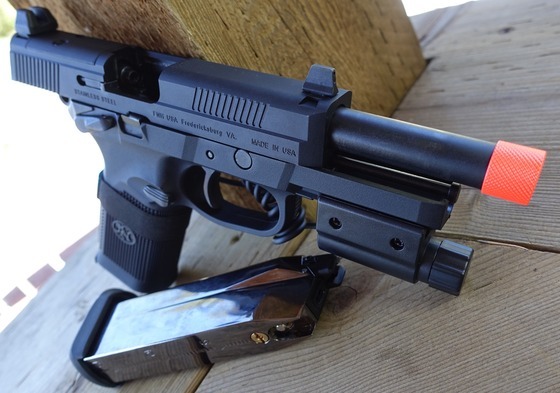 When shooting in double action the trigger pull length is much longer and heavier and has a bit of a stickiness too it but since this is a blowback pistol most of your shooting will be in single action mode where the trigger feels great! 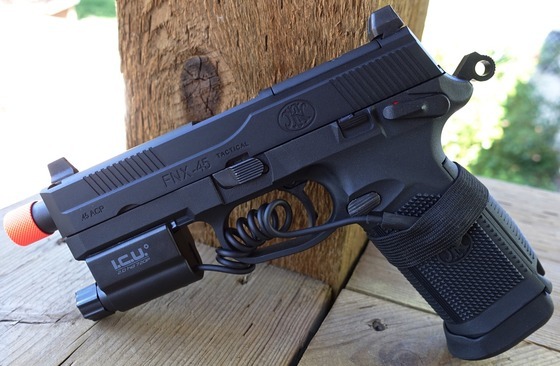 Accuracy: I haven't done a dedicated Field Test Shooting Video yet for the VFC FN Herstal FNX45 Tactical GBB Airsoft Pistol but I did get the chance to play around with it when I did my I.C.U. 2.0 HD Action Camera review. In terms of power and accuracy it feels pretty good and you can expect to get decent power and accuracy out of it, we will have to wait and see how it performs on paper targets and when tested on the Chrony. 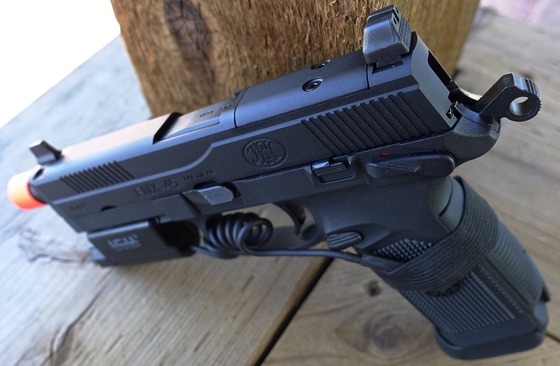 Build Quality: The VFC FN Herstal FNX45 Tactical GBB Airsoft Pistol is well made overall, I have found pretty much all the VFC airguns I have gotten my hands on seem to be well made and very realistic. you will find metal parts where they would be on the real Steel version of this pistol and same goes for plastic parts like the frame in this case. The finish seems to be holding up nicely too for me. 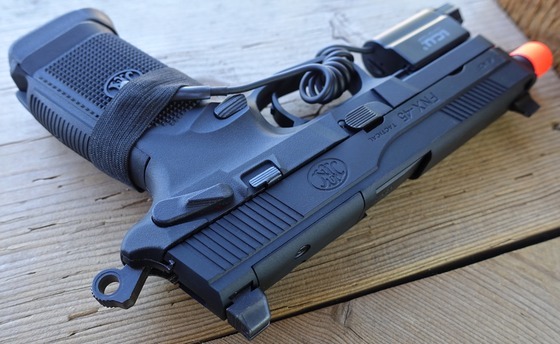 Realism: VFC really seams to pay a lot of attention to every detail of their Airsoft guns and the VFC FN Herstal FNX45 Tactical GBB Airsoft Pistol is no exception. All the mechanical working parts on this Airsoft version work as they would on the real .45 ACP FN Herstal FNX45, even the extractor is a separate part not moulded into the slide like you would find on most Airsoft pistols. You also get Interchangeable Back Straps to accommodate different hand sizes and of course it's fully FN licensed! Excellent reproduction of the real steel FN Herstal FNX45 in looks and operation. Very Crisp Firm full blowback operation. Everything is Ambidextrous so great for lefties too. High Rise sighs suitable for the addition of a moc suppressor. Comes with two interchangeable internal barrel lengths. Comes with a red tip. My serial number plate fell off while shooting it so make sure yours is on tight. Like I have mentioned throughout this review, VFC not only makes super realistic Airsoft guns, they also make a really high quality product. 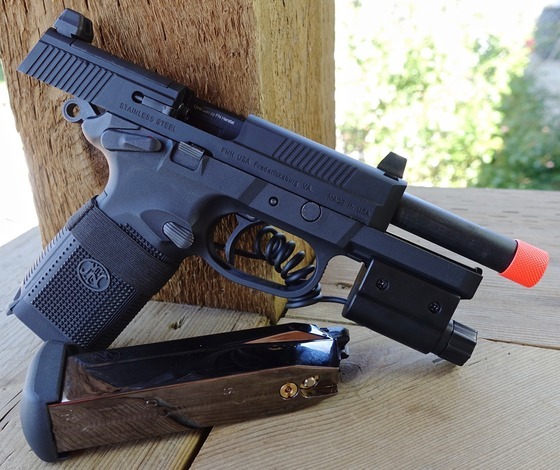 The VFC FN Herstal FNX45 Tactical GBB Airsoft Pistol is another example of this and offers everything you would hope to expect in an Airsoft Replica! The only down side is the orange tip but that can be sorted out easy enough after you get it. 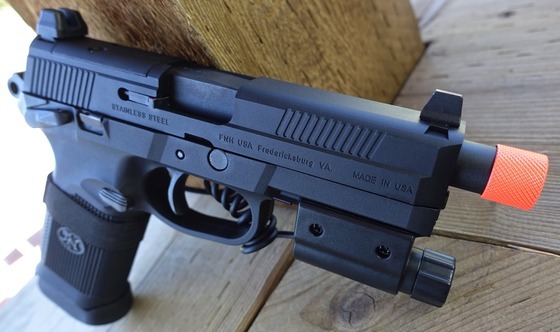 It's definitely not a small gun so keep that in mind when deciding on buying it, overall the VFC FN Herstal FNX45 Tactical GBB Airsoft Pistol is a really nice Airsoft gun at a reasonable price point.